There's probably no Stephen Sondheim show which more divides fans than Into the Woods, the musical he wrote with James Lapine about what comes after "happily ever after." It's not two groups debating the merits of the show; it's one group loving Act I but hating Act II, and vice versa. The first act opens with Cinderella, Little Red Riding Hood, Jack (of beanstalk fame) and Rapunzel going into the woods on various personal quests. Lapine adds a baker and his wife trying to break a spell put on them by a neighboring witch. These characters bump against each other in comical ways while pursuing their own agenda. Sondheim's music is lyrical and bright and Lapine's dialogue and plot fresh and funny. The whole act wraps up (as fairytales do) with everybody receiving their appropriate happiness or punishment. The second act is a much, much darker affair, as these characters come to see that their egocentric actions have unforeseen consequences, lethal to themselves and the people around them. Until the recent Broadway version of Grey Gardens, there hadn't ever been a musical with such polarized acts ... or fans. And though I like each act for different reasons, the radical shift between bouncy Act I and somber Act II is jarring. Carnegie Mellon University's School of Drama presents a wonderfully talented company taking full advantage of all Sondheim and Lapine offer. Given how perfectly cast this very large musical is, how "just right" every actor is in his or her role, it almost seems as if it were written specifically for them. 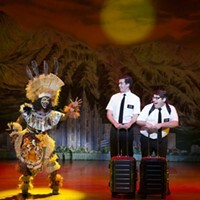 With a show this big, director Kent Gash can be credited with keeping the whole thing as lucid and as compelling as it is, and he's responsible for the strong performances of this company. Gash has every reason to be proud of what he has this company do with Into the Woods ... he needn't add anything else. 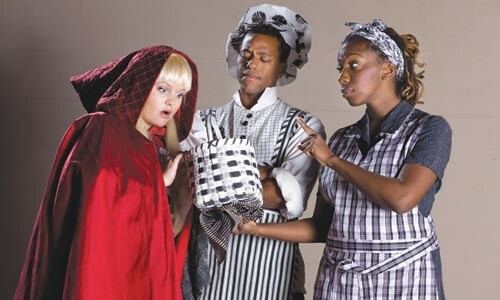 Into the Woods continues through Sat., Nov. 22. Philip Chosky Theater, Carnegie Mellon campus, Oakland. 412-268-2407. 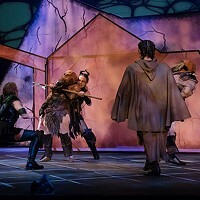 Once upon a stage: (from left) Jon-Michael Reese, Roberta Burke and Amanda Jane Cooper in Carnegie Mellon's Into the Woods.